Already have a website? Is it getting the results you’d like? If not, why not call Infinity Design Studios for a FREE Website Evaluation? Click here to find out more! We will look over your site, offer suggestions for improvement, and provide you with a FREE, NO OBLIGATION quote/proposal and help you on the path to a professional, PROFITABLE website in no time! What are you waiting for? Call or contact us today! at 570-398-9700 or email us at sales@infinitydesignstudios.com and ask for your FREE website evaluation! At Infinity Design Studios, we take the hassle out of having an online presence for your business or organization. Let us handle your website, which will free you up to handle what you do best... your business! We also offer quality website hosting, from small accounts all the way up to a Dedicated Server. Infinity Design Studios is one of Central PA’s premier website design firms. We are located in Clinton County, Pennsylvania but can work anywhere in the world. You don’t need to be local to use our services. Let us show you how! 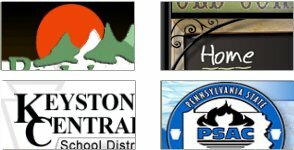 We primarily serve Clinton, Centre, and Lycoming Counties in PA, but we do have web design clients all around the united states who are happy to have us be their web designer of choice. Give us a call and find out why you should too!